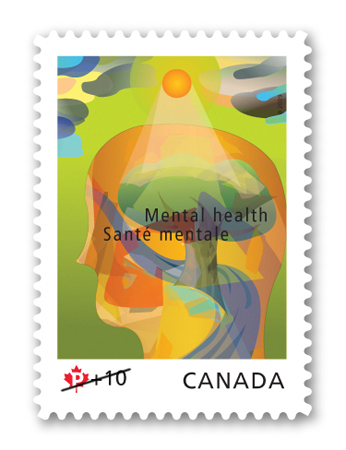 On September, 14th, 2009, Canada Post began issuing a new stamp designed to heighten awareness concerning mental health issues. In 2007, Canada Post decided to adopt mental health as its cause and established the Canada Post Foundation for Mental Health. More than $1 million was raised in 2008 by the Foundation. Statistics concerning mental illness are sobering: 20% of Canadian will experience a mental illness in their lifetime. Unfortunately, stigmas still exist which can make it difficult for individuals to seek the help they need. This awareness program will hopefully break down these barriers and contribute to a more balanced view of mental health issues. The stamp features the form of a head against a background of vibrant colours. The road travelling through the design well illustrates the journey to mental health, with a bright sun shining on the form a tree, a symbol of health and growth. A message of hope and health clearly shines through this stamp.